Raising Ella Lynn: Ms. Ella is growing! Ms. Ella had her 2 month check up last week and our little girl gained 2lbs!!! YEAH for Ella!!! She is almost 8 lbs now. When I saw 7.13 register on the scale, I was so happy I wanted to hug the nurse. It's funny how such a small thing could make me so happy, but it did. It was so awesome. I was on cloud 9 for the rest of the day. My little baby is growing just like she should. 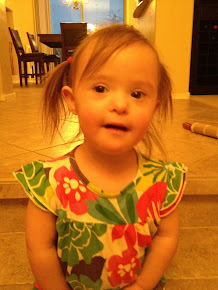 No label of Down syndrome is slowing her down! I was so proud of Ella and proud of Mike and I for not killing each other over the past 9 weeks while we have existed on no sleep and a crazy feeding schedule. I have been doing good these past few weeks. Not blogging as much because I am swaped with work, kids, cleaning, life in general. I always think about posting, but when I sit down to type, I just don't have the words there like I used too. In the beginning, I would sit down and my feelings would flow from my heart to my fingertips faster than I could type. I would just type and type and when I was done, it would all sound so perfect and so honest and I would hit submit and it was done. Now though, I am at this place with Ella and our feelings that is more complicated than the raw emotion I felt in the beginning. I am accepting and so in love with my new life but there are times where I will be doing just fine and then, out of nowhere, I will be at the grocery store and see a mom with her daughter and I will just tear up. I get angry for what this God we all believe in has taken from my daughter. I get mad that her daddy will never walk her down the aisle, I get mad that she will never be cheer captain. I get sad for the times that I know kids will stare at Ella and make fun of her. I feel these things, but I feel like feeling them is silly and useless. These aren't the things that matter in life. What matters is that you are loved and happy and safe. Getting married is important, but parents don't love their unmarried kids less. Being cheer captain is great, but I wasn't cheer captain and my mom and dad didn't seem to care. Kids made fun of me and I am a very capable, smart adult who wasn't adversly affected by it. See, I get mad and sad for Ella but then I get mad at myself for worrying about these silly, trivial things that don't really matter. I might dwell on what she won't have, but I need to dwell on what we will have. Love, hugs, smiles, popsicles on the patio with her brothers, shopping days with her grandmas, sleepovers with her aunt. She will be just fine, cheer captain or not but I can't stop myself from feeling this way from time to time.